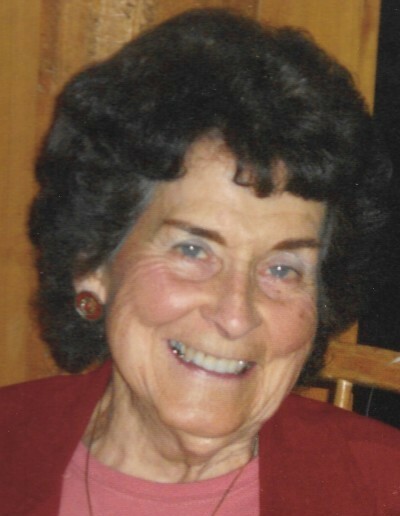 Annette left her earthly bonds on April 2nd, 2019 at Health Center Northwest. She was welcomed to this earth by a mid wife in her parents log cabin in Proctor, MT on July 29th, 1921 to Robert Lee and Bessie Kay Walker. She was the youngest of 3 siblings. Annette attended a one room grade school by horseback in Proctor and graduated from Flathead High School with the class of 1940. During much of her time in high school she would stay in Kalispell with friends of the family while taking the bus back home to Proctor on the weekends. As part of a hard working farm family, Annette along with her two brothers Tom and Leon lived through and experienced the Great Depression. During her child and teen years Annette loved to fish Dayton Creek, help her grandmother cook and bake, and roam the hills of the Proctor Valley. Annette’s work ethic began at the age of 8 when she worked for her uncle Charlie at Camp Tuffit and later on at Smith’s Campground Resort. On September 25th, 1941 she married Richard V. Bain of Kalispell. They had six children over the course of the next 18 years and resided in Evergreen. Most of this time Annette was a homemaker, and her and Richard spent their free time dancing with friends, traveling and attending D.A.V. meetings, and spending quality time camping and fishing with family in the South Fork. She will always be remembered for her cooking and baking prowess. Annette and her kids won several ribbons at the annual county fair. She was an excellent pie maker, and always had buckets of cookies on the kitchen counter awaiting the hands of her visiting grandkids! In 1965 Annette and Richard purchased and built a 2nd home on Bitterroot Lake with the intention of making it a summer home. Richard passed away unexpectedly on November 5th, 1978 while hunting. In 1986 Annette married Bill Wilson and they enjoyed extensive travels throughout the country and abroad until his passing of cancer in 1996. Annette worked as Richard’s bookkeeper in the construction business, as an employee at the Cherry Warehouse, ran the local Popcorn Wagon, and a short stint as a baker at the B&B restaurant. She later was employed as the clerk at The Daily Inter Lake circulation department, a District Manager and eventually the Circulation Manager. She retired in 1980, sold her home in Evergreen and moved to the lake full time. Annette was active in 4-H, her kid’s activities, and working and volunteering with the Disabled American Veterans Auxiliary. She ran the weekly Bingo parties at the Columbia Falls Veterans Home for over 40 years. In 2003 Annette was awarded the prestigious John E. Sloan memorial award in Helena for her distinguished service to veterans and their families. For over 20 years she held annual picnics at her lake home each summer honoring the veterans who resided at the Veterans Home. Annette was a matriarch in every sense of the word and held the respect of each of her children, grandchildren and great grandchildren. Many special celebrations of her annual Thanksgiving and Birthday get togethers at the lake will be forever etched in all our memories. Continuous laughter and sharing the many stories of the past entertained us all! Annette will be sorely missed, however she is now enjoying re-uniting with all her loved ones who passed before her. Annette is preceded in death by both parents, her brothers Tom and Leon Walker, both husbands, daughter in law Lori Bain and granddaughter Jessica Wolf. She is survived by daughters Carolyn and husband Joe Messner, Richie Kay and husband Jerry Stone, Valerie and husband Merritt Wolf; and sons Dennis Bain and wife Marilyn, Greg Bain and wife Clare LaMeres, and Jeff Bain and life partner Sandra Ravetto. She is also survived by 13 grand children and 30 great grand children and many nieces and nephews. Services will be held at Buffalo Hill Funeral Home on April 6th at 11:30 a.m. with a graveside service following at the C.E. Conrad Memorial Cemetery. Visitation hours will be Friday April 5th from 5 to 8:00 p.m. and Saturday April 6th from 9 a.m. until time of service. In lieu of flowers donations in Annette’s memory may be made to the Columbia Falls Veterans Home or to the Disabled American Veterans. Following graveside services a reception will be held at the Country Inn’s & Suites at Glacier International Airport.